In March 2017 Leona’s Skelton’s book on the history of the River Tyne was published by White Horse Press. 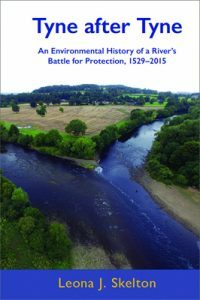 Over the last five centuries, North-East England’s River Tyne went largely with the flow as it rode with us on a rollercoaster from technologically limited early modern oligarchy, to large-scale Victorian ‘improvement’, to twentieth-century deoxygenation and twenty-first-century efforts to expand biodiversity. 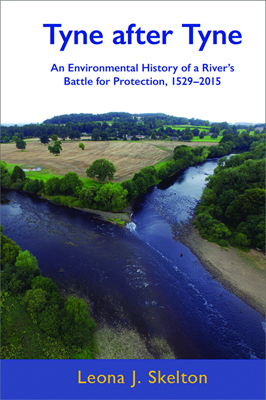 Studying five centuries of Tyne conservatorship reveals that 1855 to 1972 was a blip on the graph of environmental concern, preceded and followed by more sustainable engagement and a fairer negotiation with the river’s forces and expressions as a whole and natural system, albeit driven by different motivations. Even during this blip, however, several organisations, tried to protect the river’s environmental health from harm. 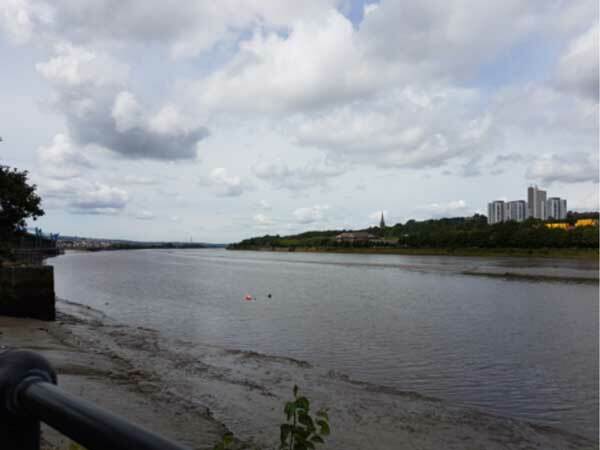 This Tyne study offers a template for a future body of work on British rivers that dislodges the Thames as the river of choice in British environmental history. And it undermines traditional approaches to rivers as passive backdrops of human activities. Departing from narratives that equated change with improvement, or with loss and destruction, it moves away from morally loaded notions of better or worse, and even dead, rivers. The book fully situates the Tyne’s fluvial transformations within political, economic, cultural, social and intellectual contexts. With such a long view, we can objectify ourselves through our descendants’ eyes, reconnecting us not only to our past, but also to our future. See more details and order the book on the White Horse Press Website. Read also a blog by Leona on her new book on the publisher’s website. 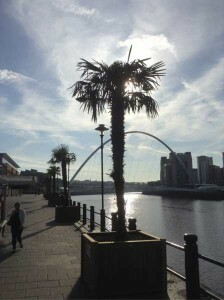 People have been enjoying north-east England’s River Tyne for centuries. Thomas Bewick, the renowned eighteenth-century engraver and author of A History of British Birds (1797), was raised on the south bank of the Tyne at Cherryburn near Stocksfield. As a child in the 1760s, Thomas ‘persuaded his friends to crowd on to a huge piece of ice, which they steered downstream opposite the Parsonage garden, enjoying the sight of the Revd Gregson raising his hands in despair’. 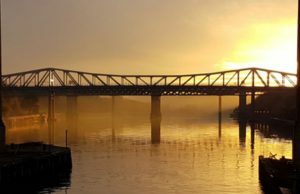 He spent most of his adult years living and working in Newcastle, near his workshop on The Side, but he walked back upriver to his original family home many times. While Bewick’s art was universal in its appeal, his biographer, Jenny Uglow, has highlighted that it is also ‘rooted in Northumberland and in the valley of the Tyne’, elaborating that ‘all his life he walked the banks of the river and he knew it in all its moods, sleepy under early morning mist, driving on in flood, ruffled by wind’. Many of Bewick’s skillfully woodcut vignettes feature people crossing and working alongside the river. He knew his river intimately, and it undoubtedly shaped his life’s work. In 1859, a librarian of the Royal Society, Walter White, embarked on an extensive tour of Northumberland, including a walk from Alston along the South Tyne and then along the main Tyne to Tynemouth. After having ‘to cross a few acres of turnips to get to the point where the South and North Tyne meet together in one broad stream’, he described Warden Rock (also known as Waters Meet) as ‘a wild spot’. 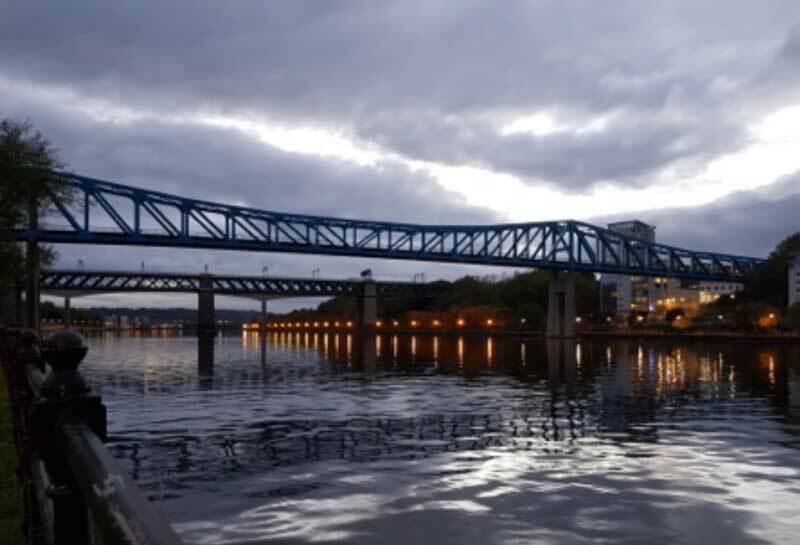 White left us a highly detailed account of the Tyne riverscape, having studied the river’s changing character intently, stopping at many places en route. 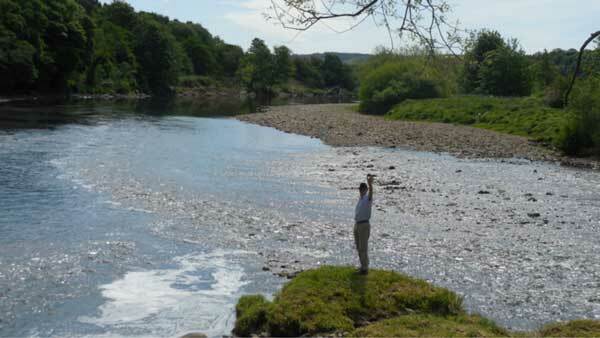 At Alston, he described the South Tyne as ‘a shallow mountain river, in a bed filled with big stones’. Walking from Haydon Bridge towards Hexham, White described the main Tyne as ‘a smiling vale beautified by cultivation and foliage … rippling cheerfully in reply to the salutations of the leaves’. He was explicitly aware of entering a new and different zone of the river in the estuary, which he called the ‘smoky region’. On reaching the outskirts of Newcastle, at Newburn, he discerned ‘a route that revealed to me a disagreeable variety of dirt and disorder … the great army of industry’. Both Bewick’s woodcuts and White’s descriptions of the Tyne resulted from innumerable observations during riverside walks, the former’s of one relatively small section repeatedly over the course of his life and the latter’s during one linear walk from source to sea. Many of the people I interviewed over the course of researching my forthcoming book, Tyne after Tyne, shared their own surprisingly deep and intimate experiences of walking along the river, seemingly repetitive journeys along quite small sections as often as twice a day to walk pet dogs or to commute to work. In the course of analysing these oral history transcriptions, I realised that the walks were far from repetitive because each day, and often every hour, created a necessarily unique riverscape, as the water interacted with widely different weather conditions, different wildlife and different human activities. While reflecting on my interviewees’ stories, I realised that, while I had spent two years researching the river’s archives, grown up near the river and knew the catchment fairly well overall, I was nonetheless unable to talk about even one section in anywhere near the depths achieved by so many of the interviewees. In his influential The Making of the English Landscape (1955), William Hoskins likens landscape to a ‘symphony, which it is possible to enjoy as an architectural mass of sound, beautiful or impressive as the case may be, without being able to analyse it in detail or to see the logical development of its structure’. I wanted to understand just one section of the Tyne in depth, perceiving, as Hoskins advised, ‘the manifold subtle variations on a single theme, however disguised it may be’, so that ‘the total effect is immeasurably enhanced’. wind. I could easily write a book about the Tyne’s natural beauty, about its engagement with the climate and its flora and fauna, but, as my environmental history research revealed, the river’s true story is not that simple. 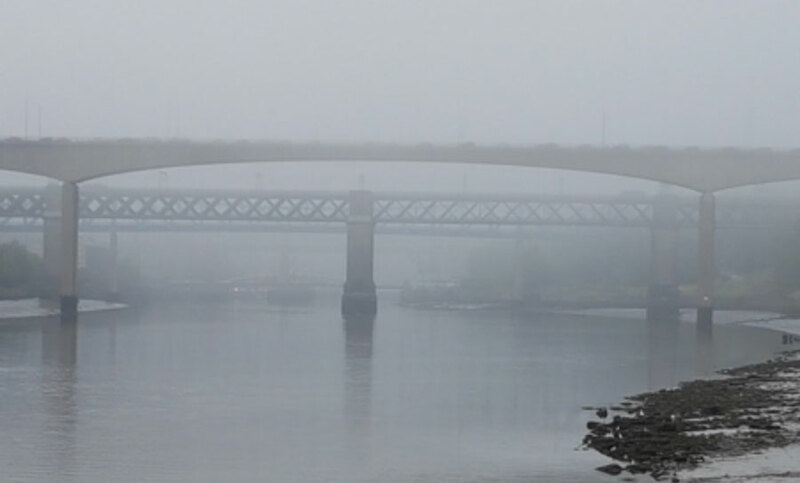 The Tyne is not a natural river, but neither is it entirely a human creation. Inextricably entangled with the river’s so-called ‘natural’ aspects, I have witnessed paddle boarders, speed boaters and anglers interacting with its flow. Nobody can ignore the colossal, multi-layered infrastructural monuments which pull us back to its industrial era of smoke, factory hooters and a hubbub of ships. This infrastructure, too, is merely a compromise between human aspirations and the river’s natural forces and expressions. Appreciation and deep understanding of a micro-scale environment is only possible when one communes with it very regularly, year after year and even decade after decade, usually facilitated by someone living very close to it. For example, Nan Shepherd’s A Living Mountain leaves the reader in no doubt that she visited the Cairngorms a great number of times over the course of her life. Similarly, John Lewis-Stempel’s The Private Life of an English Field: Meadowland, which describes the micro-scale processes and interactions between a farmer, his family and the flora and fauna in one meadow in Herefordshire over the course of one year, confirms the author’s exceptionally intimate relationship with a very small-scale environment. A relatively early and important example of one particularly intimate relationship with the flora and fauna of a local area, Gilbert White’s Natural History and Antiquities of Selborne (1789), was based on an incredible 43 years of nature and weather diaries detailing fastidiously the minutiae of the area around his parsonage in Hampshire. As a historian, I am trained to search for discontinuities, marked and important changes over time which I can explain using documentary evidence. Walking along the same section of the river for over two hours each day has taught me that this formidable river is forever changing, in obvious but also in subtle, complex and unfathomable ways. It is quite literally ‘wonder’-ful. Even focusing on a two-mile stretch of the river, it would be impossible to explain its true complexity in a book. Writing the Tyne’s environmental story over five centuries was a worthwhile and productive task. But it provides a framework which can and should be rendered more complex than words can express by getting out to walk its many sections, time and time again. I’m still hooked on my first two-mile section, and plan to walk with and against its flow for at least another two or three years until I, perhaps, begin to ‘know’ it. J. Uglow, Nature’s Engraver: A Life of Thomas Bewick (London: Faber and Faber, 2007), p. 15. Uglow, Nature’s Engraver, pp. 402–403. W. White, Northumberland and the Border (London, 1859), p. 41 (ch. 6). White, Northumberland and the Border, p. 26 (chapter 4). White, Northumberland and the Border, p. 40 (chapter 6). Ibid., p. 51 (chapter 6). W. Hoskins, The Making of the English Landscape (1955), p. 3. Hoskins, Making of the English Landscape, p. 3. N. Shepherd, The Living Mountain, 2nd ed. (Edinburgh: Canongate Books, 2011). J. Lewis-Stempel, The Private Life of an English Field: Meadowland (London: Black Swan, 2014). G. White, The Natural History and Antiquities of Selborne (1789). This blog was originally published on the website of the White Horse Press. Leona’s book, Tyne after Tyne will be published by The White Horse Press in March 2017. After finishing my project, ‘Degeneration and Regeneration on the Tyne: River Pasts, Presents and Futures’, in November 2015, I embarked on a challenging but very worthwhile opportunity to work as a Research Assistant at the University of Sheffield within the Sheffield Water Centre’s (SWC) Pennine Water Group (as it came to a close). Since January 2016, I’ve been working within SWC’s new Engineering and Physical Sciences Research Council-funded (EPSRC) five-year research project, ‘TWENTY65: Tailored Solutions for Positive Impact’. The project was designed in response to EPSRC’s Grand Challenge for Water. It aims to find innovative and interdisciplinary solutions to the serious challenges which threaten the UK water industry’s long-term sustainability up to 2065 and beyond, notably its ageing infrastructure, leakage and the low value water users place on water. Working closely with civil engineers, social scientists and industry partners has enabled me to deploy my environmental history expertise strategically and usefully. It has also sharpened my awareness of the practical uses and the unique value of environmental history research in the context of infrastructural, societal, attitudinal and governance challenges in the water industry. Today, UK water users wash their cars and hose their lawns using water which meets a standard sufficiently high for use in the pharmaceutical manufacturing of highly complex medicines. Yet many households are charged little more than £1 a day for the water-supply and sewerage services on which they rely very heavily for the basic processes of daily life. Until people experience an interruption of supply, few truly appreciate the complexity and exceptionally high ‘value for money’ in their water services. If consumers were asked to sort their utility bills into rank order according to: 1) value for money or 2) according to how much they would be prepared to pay for them, how many would place water at the top of either of these hierarchies? Where would broadband and energy fall in relation to water? TWENTY65 is developing disruptive technologies and more effective mobilisation initiatives to increase water users’ valuing of water, to reduce water usage and to give water users a stake in the infrastructure on which they rely so heavily. As a historian, I’ve considered in depth the factors which have reduced people’s valuation of water over time. Increasingly centralised and efficient water services have facilitated an increasing physical distance between the consumer and the processes of using and disposing of water. In short, the engineers have done too good a job behind the scenes, enabling water users for the most part to take their water supply, waste water disposal and their water engineers for granted. TWENTY65 comprises eight themes, ranging from demand-based technologies for tailored treatment, to robotic autonomous systems for water infrastructure inspection, to integrated urban water management and reuse systems. I have been working with a social scientist, Dr Liz Sharp, on theme six, ‘Enhancing Water Services through Mobilisation’, which seeks to demonstrate the potentially powerful non-technological ways in which people can be mobilised to change their behaviour as water users. We are arguing that consumers can be encouraged and supported to become more engaged with their water services, water infrastructure and the regulation of water use and abuse in their local communities, obviating at least exclusive reliance on complex and expensive robotic technologies. Currently, several serious risks endanger water security: climate change, underinvestment in infrastructure, complex and counterproductive regulation of the water sector and water users’ low valuation of water (largely resulting from their poor understanding of its complex and expensive functions). Attitudinal changes brought about by increasing water citizenship initiatives would help to mitigate these risks by reducing water consumption, increasing the value placed on water (and potentially the amount people are prepared to pay for water) and widening water users’ perspectives to embrace the whole ecosystem and the water cycle which runs through it. TWENTY65 Thought Leadership Clubs (TLCs) enable academics from several disciplines and a wide range of water industry partners to work together to develop potential solutions to the industry’s major challenges. At the last TLC, in Sheffield in July 2016, we discussed many issues, including why the UK government doesn’t have a Water Minister. This is a very good question. If we had a Water Minister, would they be able to catalyse attitudinal changes which could substantially increase the value society places on water? It might be worth a shot. In addition to the TLCs, we are writing eight white papers which will be disseminated across the water industry. They discuss how ‘Big Data’, ‘Water Citizenship’ and the ‘Storage and Recovery of Energy’ from sewerage systems could support the water industry’s long-term sustainability and resilience, drawing from a wide range of case studies from around the world. The ‘Hydraulic State’, a political-ecologic paradigm coined by historian Karl Wittfogel, (Oriental Despotism: A Comparative Study of Total Power [New Haven: Yale University Press, 1957]) developed with five salient characteristics: 1) centralised governance frameworks; 2) technical engineering expertise; 3) investment in hard infrastructure; 4) centralised supply and disposal networks; and 5) disengaged water users. However, in seeking to explore what forms of distributed and user-organised services might replace the ‘Hydraulic State’, surprisingly little attention is given to highly relevant past experiences of water services which were locally distributed, did not rely on costly engineering expertise, were closely aligned with local environmental needs and were not environmentally or financially expensive. As water managers currently explore whether and how to disassemble technocratic enterprises to make way for more participatory and democratic forms of decision making, past experiences of distributed or transitionary forms of water management may offer patterns of water practices or of institutional-public relations that can inspire the planning of alternative water futures. 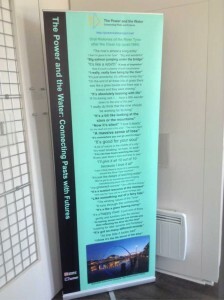 By looking back through time at the governance frameworks of water use which the Hydraulic State broke down gradually and eventually replaced, I have argued that we can find inspiration for new and different ways of re-engaging water users with the systems and processes which underpin their most vital, life-sustaining utility service. This invaluable interdisciplinary experience will stand me in good stead as I return to a History Department (and to the Tyne!) in my new role as Vice Chancellor’s Research Fellow in the Humanities at Northumbria University in Newcastle. In July 2016, I handed in the manuscript of Tyne after Tyne to White Horse Press, and I felt overwhelmed by its 112,000 words. Writing a five-century history of one river’s dramatic story was challenging, to put it mildly, and I was quite proud of a fairly mammoth work, having analysed around 1.5 million words of archival and oral history transcriptions. But last week, for the first time in months, I visited the river near Gateshead and as I watched the Tyne’s powerful flow charging down its channel towards the sea, my manuscript seemed comparatively pithy. No book, however lengthy, could ever do justice to such a mighty river, packed to the brim with such a multitude of deep and complex meanings in the minds of all of the different people who’ve interacted with it over five centuries. It’s a big river, and I’ve written a big book about it, but I haven’t written the river’s total history. I’ve merely taken a tour through the major milestones, highlighting some of the most insightful socio-environmental relationships it has forged with the humans who have used and abused it, and played with, loved and become frustrated with it, from one generation to the next. As I looked up the steep river banks behind me towards Windmill Hills, I remembered very clearly sitting up there on a bench one dull, cold day with my primary school class at the age of ten (in 1994, before the new housing estates were built there). The teacher had given each of us a sheet of paper on a clipboard and some charcoal pencils and asked us to draw the riverscape below us. We all smudged the charcoal on the paper to give the impression of enormous clouds of smoke. Everyone’s hands, coats and clothes were marked with the charcoal. We all drew the bridges, the river and the buildings of Newcastle, but some of my classmates drew enormous smoky ships which weren’t there. Others drew very large fish and I drew a big old-fashioned sail ship like the ones I’d seen at the Tall Ships event in 1993. I remember the teacher’s disbelief as she looked at the various pictures. She made us start again. “Draw what you see”, she instructed. But even at ten years old, we were envisioning different rivers in our minds, unique visions of our local river produced from a combination of family anecdotes, memorable events such as the Garden Festival (1990) and the Tall Ships Race (1993), lessons at school about pollution and its impact on fish (always bright orange, smiling, cartoon fish) and our own visits to the river, the beginnings of our generation’s relationship with it, and, not least, of the river’s relationship with us. What would Tyneside’s ten year-olds draw today…? What would the ten year-olds of 1900 have drawn? When I heard that Hunter was planning to make a film based on his dissertation topic, I was keen for the ‘Power and Water’ project to be involved (especially since he’s surfed the Severn Bore on at least one occasion, and tells me that Bristol’s proximity to The Bore was one of the reasons he chose to study here). The project is delighted that it was able to cover the cost of including film clips from the North East Film Archive (NEFA). Hunter’s film is entitled ‘Scorched Earth’. Memory fastens on sight. I learnt this while speaking with Frank Duke, a shipwright who had worked the length of the River Tyne and spent his working life building super tankers. It was not simply the loss of his job, but the changing relationship with the industrial landscape of Tyneside that led him to feel alienated by his surroundings, the past and a deep loss of identity. Scenes of demolished shipyards, redundant and vast open spaces, haunt the landscape along the Tyne from Hebburn to Tynemouth. As one resident of Wallsend told me, ‘the absence of ruin often demonstrates the ruin’. The last vestiges of the Tyne’s industrial prowess are now in their final stages of decay and a decade has elapsed since the last remaining shipyard on the river, Swan Hunter, closed shop. The loss of industry’s visual record from the landscape is shocking for two reasons. Firstly, we live in a heritage culture which dismisses monuments of the working class, whether in the form of coal, steel, shipbuilding or engineering works. Secondly, in their transience, industrial ruins betray a sense of permanence granted by the materials out of which they are constructed: concrete, iron, steel and brick. Every single shipyard I visited was an exhibition in decay. They felt haunted, quiet and beautiful in their contorted state of ruin. Even in the archive footage from the 1980s that I included in my film there seems to be an attempt to eulogise these monumental structures and venerate a dying industry. Today, as we walk through regulated cities, the site of a ship launch or the view of decaying berths at Hawthorn Leslie are untrammelled in their unique oddness. For someone like myself, born in 1992, who never witnessed these industrial landscapes in their prime, I find the site of industry captivating in its bizarreness. In making a documentary about these themes I wanted to better understand how people adapt to deindustrialised spaces and how such alterations become internalised by communities which inhabit the boundary between “industrial wilderness” and modulated environments. Hot on the heels of our Project Workshop in Bristol, I was aboard an evening flight to Newcastle. Heading up the northwest coast to Solway Firth before turning eastward, it seemed that the descending sun was frozen on the western horizon: there was as much daylight on landing in Newcastle as there’d been when we took off 50 minutes earlier. The brisk schedule Leona had prepared for my 36-hour visit reminded me of how much we’d packed into our 72-hour team meeting on Tyneside precisely a year ago. Back in the Premier Inn Quayside (this time, though, in a room fully exposed to the incessant cries of the downtown-loving kittiwakes whose nests stud the sides of the Tyne Bridge this time of year) and after another slap-up Weatherspoons breakfast al fresco on the quayside, near the magnificent old Fish Market (now some grotty night club), we drove out west to the confluence of the river’s North and South branches near Hexham, where we were transfixed by the meeting of the waters (and duly noted the privatized, angling club section of river stretching to the west). From the bucolic Waters Meet, we doubled back, headed for the coast, passing through the Walker Riverside area that features in Alice Mah’s book, Industrial Ruination, Community, and Place: Landscapes and Legacies of Urban Decline (2012) and her article, ‘Memory, uncertainty and industrial ruination: Walker Riverside, Newcastle on Tyne’ (International Journal of Urban and Regional Research, 2010), en route to the Low Light Heritage Centre on Fish Quay, North Shields. 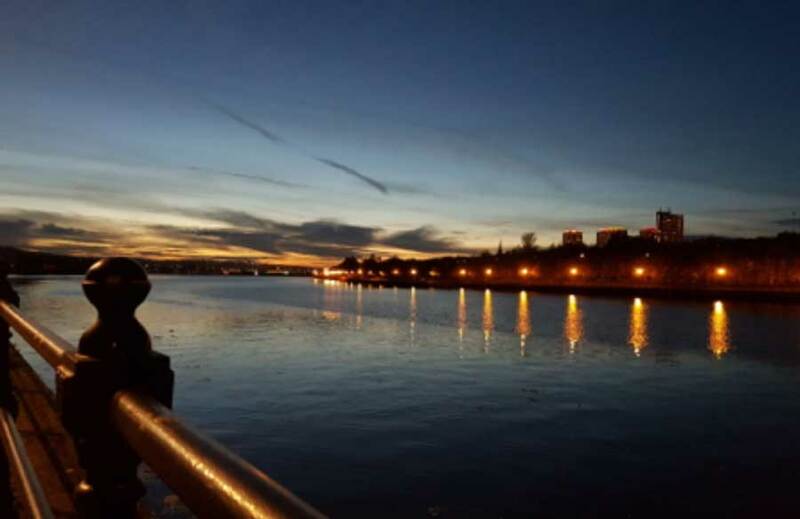 ‘Tyne Talks’: Reflections on the Tyne, before clean-up (Photo: Peter Coates). Click Image to enlarge. ‘The Spirit of the Tyne’ is the name of one of the two ferries that ply between North and South Shields – and the one we rode on. Yet it’s clear that there’s no singular spirit of the river. The other ferry is called ‘The Pride of the Tyne’, and it’s just as clear that the source of that pride varies considerably. Leona divided her oral histories between ‘Before the Clean Up (pre-1980)’ and ‘After the Clean Up (post-1980)’ and her selections underscored the lack of agreement over what constitutes a busy river and a living river. Before 1980, the Tyne was ‘a busy, busy river’. Another interviewee recalled that ‘the noise from the river was fantastic, it was just incessant’, and ‘big, vast and exciting’ was a further description. At the same times, others Leona had interviewed referred to ‘a dirty old Tyne’ and how it had been ‘in a pretty sorry state’. 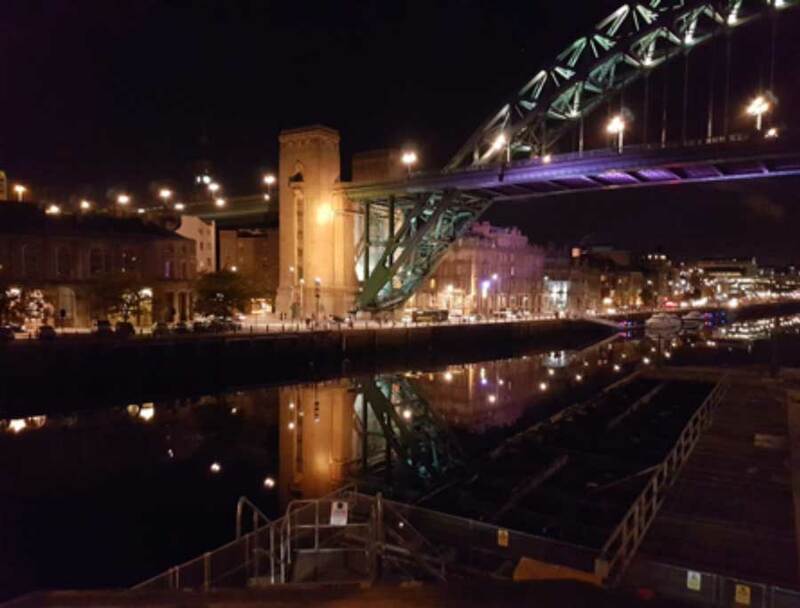 ‘Tyne Talks’: Reflections on the Tyne, after clean-up (Photo: Peter Coates). Click Image to enlarge. After 1980, though, with a cleaner river, the quality of bigness, for some, had shifted to the river’s signature fish that was back in town: ‘big salmon jumping under a bridge’. And the river was busy again, ‘absolutely teeming with life’ – though life of a different kind to human activity. 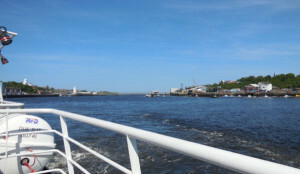 The reborn Tyne was even characterized as ‘a happy river’. But for others, it has been stripped of vitality and meaning: ‘now it’s silent’; ‘the river’s dead’; ‘it’s a wasted resource at the moment’; and (what I think is Leona’s favourite) ‘I really do think that the river should be working for a living’. Providing the biotic conditions to nurture salmon, otters and human swimmers and anglers did not constitute work according to this scenario. Regardless of whether the river is putting in a decent day’s labour or loafing around, Leona certainly put me to work. In fact, she gave me a decidedly dangerous task, informing the guests that I would speak for a few minutes about why the Tyne is nearly as important as the Mersey. Having rigorously and systematically compared the two rivers and their twin river cities’ commercial, architectural, sporting and musical accomplishments, the score with five minutes left was something like Liverpool 8, Newcastle 2. (On the ferry across the Mersey, they still play ‘Ferry ‘cross the Mersey’, but on the ferry ‘cross the Tyne, of course, they don’t have an equivalent song to play, though you’d think they could at least manage Lindisfarne’s ‘Fog on the Tyne’ or Jimmy Nail’s ‘Big River’.) And when we start talking pubs, well, the Crown Posada sure is a swell place, but where’s Newcastle’s answer to The Philharmonic? 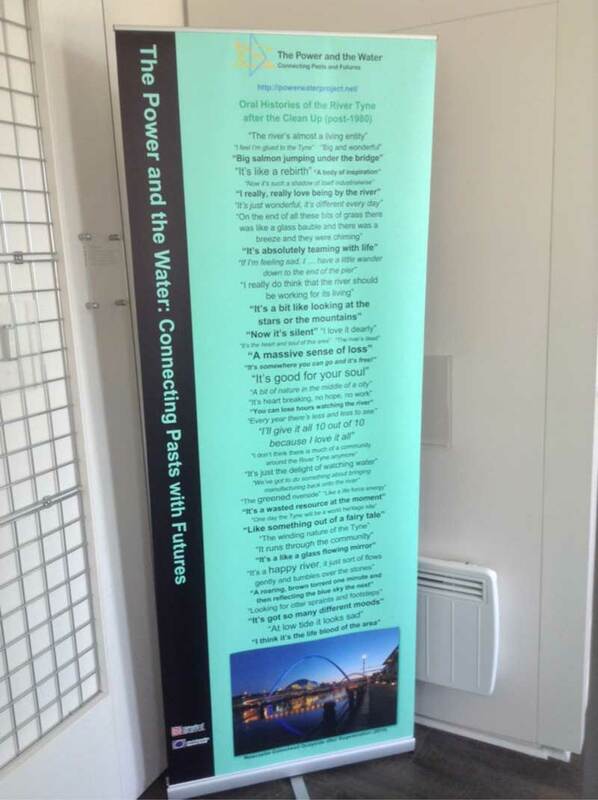 In one respect, though, and this is perhaps the all-important consideration, I had to agree with the brag on the Tyne Rivers Trust pop-up banner that the Tyne is ‘England’s greatest river’: it’s incontrovertibly England’s greatest salmon river, historically and once again. That evened up the score (as did our foray across the river to The Steamboat in South Shields, once again Camra’s Pub of the Year). But those of us gathered at the Low Light could at least all agree that big northern rivers, whose august company includes the Clyde and Tees, knock the spots off that puny, over-exposed southern stream that passes itself off as the national river. Final score: Big Northern Rivers 19, London’s River 1. Heading south to Bristol the next day on the Friday afternoon flight, the plane passed over the mouth of the Tyne. From my window seat, I could see, directly beneath us, snug in its berth at North Shields, the DFDS Seaways ferry to Amsterdam that leaves daily at 17.00. (The previous evening, pouring the wine and opening the crisp packets in preparation for the exhibition launch, I glanced out of the eastward facing window just in time to catch the grand spectacle of the ship exiting the river.) Forty minutes later, on its final descent, the plane crossed the mouth of the Avon at pretty much the same point where our boat turned and headed back into Bristol during our project workshop field trip down the river to Avonmouth. The start of the week met the end of the week; the Avon flowed into the Tyne and the Tyne flowed back into the Avon. Just don’t call it connectivity. 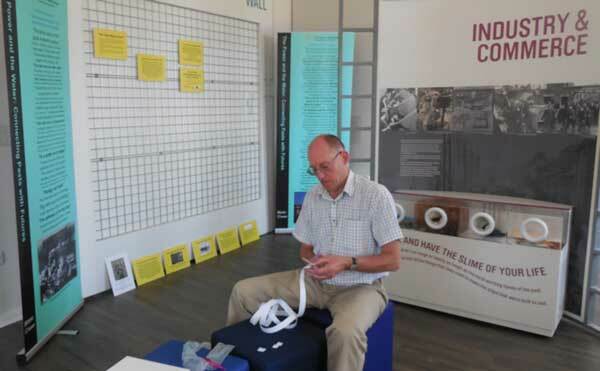 Team member Leona Skelton has developed an exhibition for the Old Low Light Heritage Centre at North Shields about the history of the Tyne River and the people living on its banks. 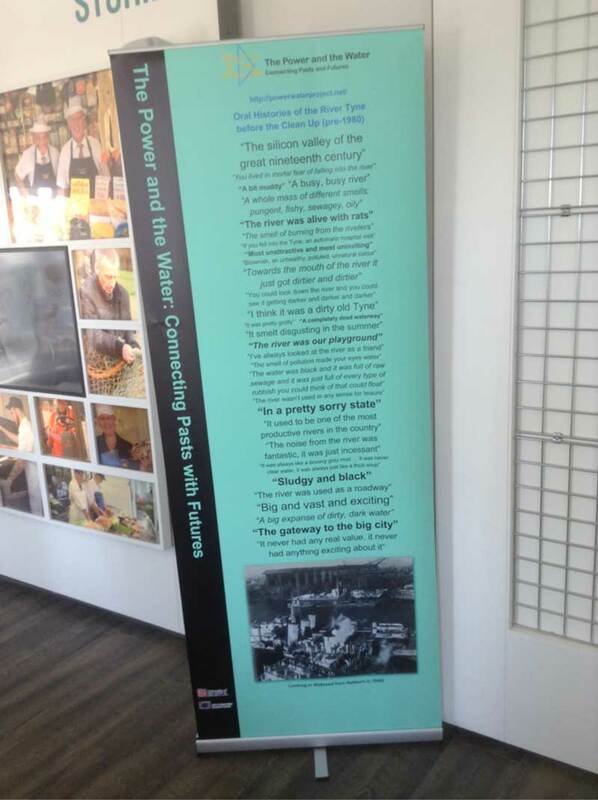 Placing the river itself at its heart, this exhibition enables us to hear the Tyne’s own story, of the enormous changes it underwent as it wove itself literally and metaphorically through Tyneside’s story and Tynesiders’ lives from 1530 to the present. The exhibition opens on 11 June and will run until 25 June. More info on the Old Low Light Heritage Centre website. Researching the environmental history of just one natural system, the River Tyne in North East England, enables me to conduct very deep archival research into a plethora of organisations’ records, but most of the extant archives are heavily engendered by the objectives of the employees who produced them. 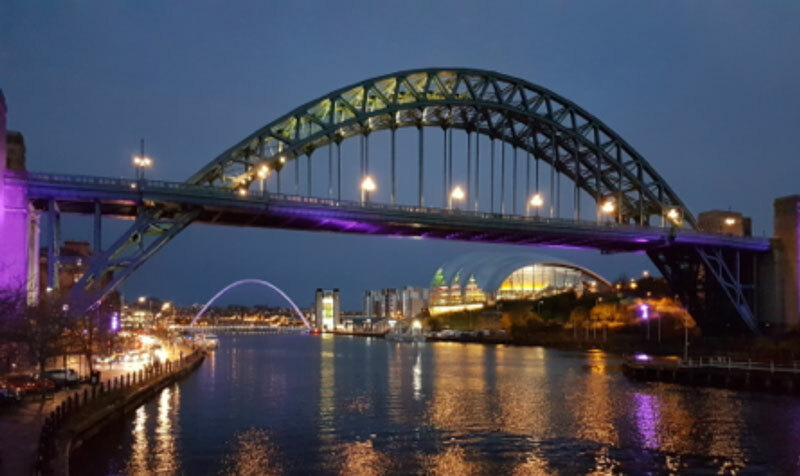 Moreover, they tend to focus on noteworthy, official events and major changes rather than more prosaic, everyday life experiences and personal, yet deep and important, relationships between Tynesiders and their beloved Tyne. Some records were written by seventeenth-century scribes working for the oligarchic Newcastle Corporation; others were written by the successive secretaries of the profit-driven Tyne Improvement Commission (1850-1968) or by those working for the national government’s Standing Committee on River Pollution which was appointed to test the river water in the 1920s and 30s. The minutes of the Tyne Salmon Conservancy (1866-1950), based upriver in Hexham, provides yet another very different perspective, transporting the researcher to a world of tweed-wearing anglers who worked hard to install fish passes, to protect the Tyne’s fish from pollutants and to restock rivers to ensure the continuance of their sport. But in all of these important records there is something missing: the gritty, the mundane, the real life experiences which demonstrate how the river’s meaning has changed as it wove its way through the lives and livelihoods of individuals, communities and the whole Tyneside region, from day to day, year to year and decade to decade, as the river underwent unprecedented and dramatic change both environmentally and in terms of how it looked, sounded and smelled to the people who sensed and experienced it directly. Unfortunately, there is no scratch and sniff on the pages of seventeenth-century manuscripts or Victorian committee minute books, but you can sit down and talk to someone who worked on the Tyne in the 1950s and ask them to describe their sensory experiences of the river, how it made them feel and when, how and why that changed over the course of their lives. Cue the Dictaphone and an enormous pack of AA batteries! I don’t need to argue the case for the enormous benefits of oral history, but I believe that its unique benefits to environmental historians are yet to be fully appreciated. 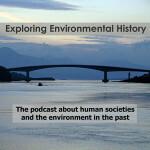 Environmental history pushes historians, perhaps more so than those working in any other sub-categories of our discipline, to incorporate into our research absolutely every aspect of a particular environment, landscape or natural system, which leads us necessarily to consider all of the senses, including sound, smell, taste and touch as well as sight. Although it is limited to living memory, oral history has an enormous potential to reconstruct past environments, to answer questions which simply cannot be answered as a result of a long stint in the archives. Even a personal diary is limited by the parameters of what has already been committed to paper; it is a finite resource. Whereas in an oral history interview, the researcher designs and then asks the questions and can chase up answers to those questions with further specific and penetrating questions in a responsive, exciting and fluid conversation, responding to the interviewees’ body language, tone and emphasis. It’s not quite creating history, but it certainly allows the researcher to harvest the particular information they need in order to answer particular research questions. Intimate anecdotes revealed in oral history interviews have illuminated the official histories I have tracked and they have imparted colour into the detailed framework which I have carefully constructed from river legislation, the coming and going of local and national governmental bodies and other organisations, world wars and major engineering projects. In short, they bring the river’s history to life and provide insightful meaning to the environmental development of the river. How else could I have learnt about the ‘chiming’ of hollow ‘ice baubles’ which hung one morning on the overturned tips of grass blades as they swung gently over the water on the river banks between Fourstones and Haydon Bridge on the South Tyne? And how else could I have heard tales of children living in Hebburn on the south bank of the Tyne estuary in the 1950s who called the river their ‘playground’ and spent entire days building rafts, sailing down the river and shooting at the ubiquitous rats with air rifles? Or the woman who moved from Dundee to North Shields specifically because the Tyne’s riverscape reminded her of the Firth of Tay and her native home. I could list a thousand stories from only twenty-six interviews lasting between twenty and thirty minutes. Some are poignant, some make me laugh and some even make me cry, but they’re all part of the Tyne’s history and I couldn’t have completed this project without them. The experiences of Tynesiders like my Grandad, who clocked on and off throughout their lives, worked innumerable shifts around the river, who literally contributed to the enormous volumes of domestic and industrial waste which poured into the estuary via over 270 sewers and who now use the much cleaner river for leisure, sport and for therapeutic reasons at the most difficult times of their lives, are central to understanding what we have done to the river and what the river has done to us. Of course, oral history itself is a form of public engagement in its own right and the interviewees are as interested in my research as I am in their experiences of the Tyne. It has been a wonderfully symbiotic process and very worthwhile in terms of the admittedly large amount of time spent on locating interviewees, organising interviews, finding appropriate locations in which to conduct them and then transcribing and analysing the recordings. The environmental historian cannot travel back in time to experience past landscapes and environments themselves, but they can talk to the people who did experience them and to people who witnessed gradual and dramatic changes day by day over decades. If the right questions are asked, the interviewee can take the environmental historian to the heart of highly complex issues such as change over time, conflict and meaning as they perceived it. Previously, I conducted an oral history research project in Kielder in Northumberland, between 2012 and 2013, as part of another AHRC-funded project, ‘The Places that Speak to us and the Publics we Talk with’. This also took me to the heart of how the successive and dramatic changes in Kielder’s twentieth-century environment, from sheep farming to commercial forestry to the flooding of the valley which is now Kielder Reservoir, have impacted on social, cultural and economic lives in the local area [see Oral History Journal, vol. 42 (2014), pp. 81-93] . Although other insightful projects have been conducted, notably Ruth Tittensor’s work on Whitelee Forest near Glasgow, An Oral History of Whitelee Forest (2009) and Peter Friererici’s oral history project in the American South West, What has Passed and What Remains: Oral Histories of Northern Arizona’s Changing Landscapes (2010), I am surprised by how little environmental historians have used this exceptionally useful method of understanding environmental change, experience and meaning. I think there is substantial scope for environmental historians to utilise oral history to a far greater extent, perhaps eventually working towards the formation of an environmental oral history society…? Where do I sign up?! Ecological Oral Histories, Navigating the Green Road: A Guide to Northern Arizona University’s Environmental Resources [webpage]. Accessed online at www.greenguide.nau.edu/oral_history.html. ‘Special issue: talking green: oral history and environmental history’, Oral History Forum d’histoire orale, vol 33, (2013). David Todd and David Weisman, The Texas Legacy Project: Stories of Courage and Conservation, College Station: Texas A and M University Press, (2010); Texas Legacy Project, www.texaslegacy.org. 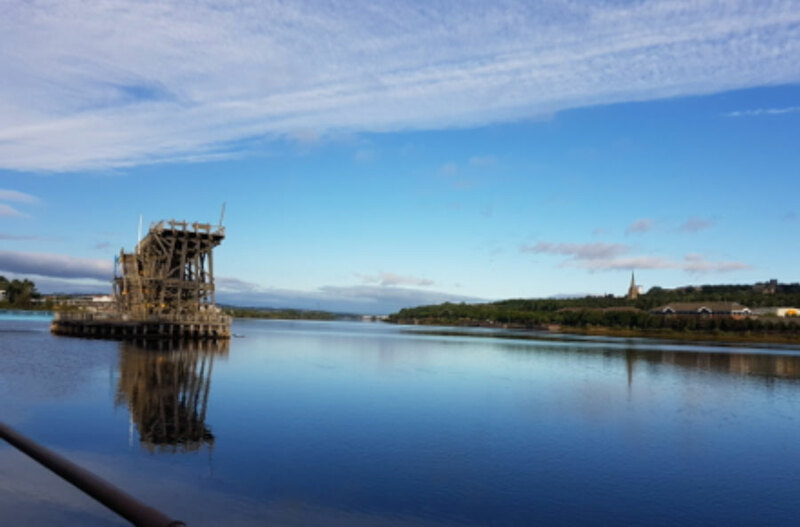 As part of their Newcastle trip in June, the Power and Water team walked through Riverside Park to Dunston Staiths with Dr Angela Connelly from the Jetty Project and David Fraser, industrial heritage researcher. Does energy infrastructure have to be redundant before it can be accepted as integral to the landscape? Dunston Staiths is an iconic window into the age when coal was king on Tyneside. Built in the 1890s and finally closed in 1980, it’s a towering wooden structure that facilitated faster coal loading onto the ships that lined the Tyne at Gateshead before hurrying their cargoes to London and other industrialising centres hungry for fuel. 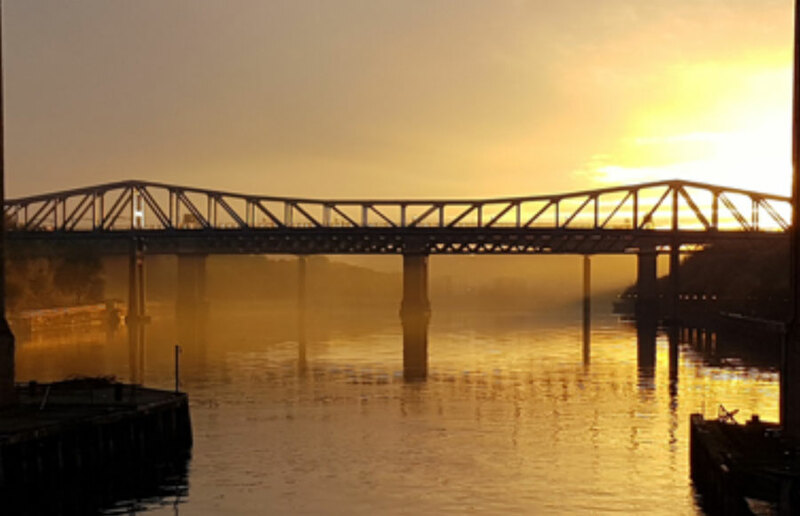 In 2013, the Heritage Lottery Fund awarded nearly £420,000 to the Tyne and Wear Building Preservation Trust as part of an ongoing restoration plan for the Staiths that includes improved public access and enhanced engagement with Newcastle’s coal heritage. 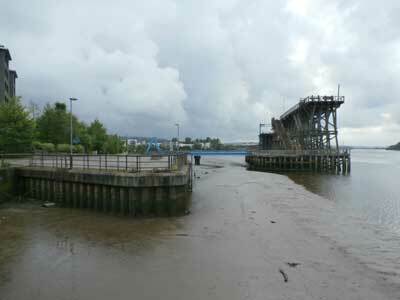 The funding also envisions the ‘reconnection of the Staiths with the surrounding saltmarsh and wider natural heritage’. The Staiths, of course, has been connected to the riverscape that it looms over ever since its construction; it’s us onlookers who need to be shown how to see it that way. On the whole, energy infrastructure tends to be too large-scale and, well, industrial, for many of us to view it as anything more than non-natural and detached from nature – and quite often, nowadays, detached from people and communities too. Dunston Staiths, now a scheduled monument and Grade II-listed building, reminds us that today’s ‘eyesore’ energy infrastructure may be tomorrow’s cultural heritage site. 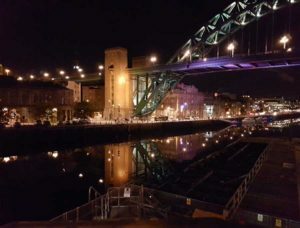 Some 35 years after the Staiths’ working life ended, it’s not difficult to view it as a grand addition to the public art dotting Riverside Park as it spools out from the centre of Newcastle. 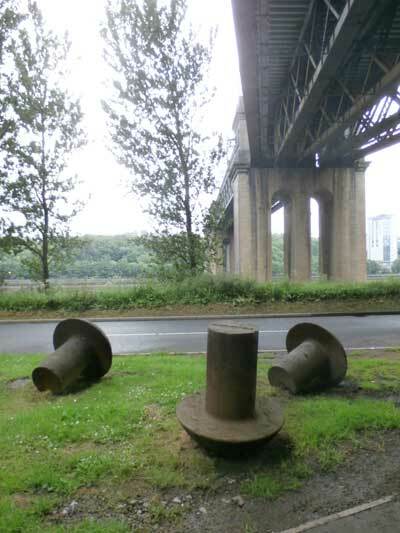 Here, works like Andrew McKeown’s ‘Riverside Rivets’ (2010) – giant rivets strewn alongside the path – anticipate the Staiths further upriver and remind us that people were working the riverbank long before we relaxed along it. As energy production methods change, the redundant infrastructure of past technologies – so often super-sized and out of scale – builds up around us. The more structurally viable of these constructions can be reinterpreted to excellent effect: viz the stunning spaces of Tate Modern, formerly London’s oil-fired Bankside Power Station. Others are more challenging: the cooling towers of Richborough Power Station in Kent were demolished in 2012, although not without debate and commemoration. As heritage technology, we can deal with energy infrastructure – celebrate it, even. If it must be demolished, there is likely to be at least some concern expressed for the loss of landmarks and historical markers. Over the years, layers of meaning can be attached to any physical presence; time and socio-cultural associations can help us to smooth over the disconnection between us and the energy structures that have sustained us. However, over and above the comfort engendered by familiarity, it seems that we may be more accepting of energy structures as integral to our communities and our landscapes once they are no longer fit for their original purpose. Are we better able to appreciate them once they are presented to us outside of their original, workaday context? What, then, does this say about our responses to the infrastructure that currently supports us – solar panels, wind turbines, nuclear reactors – or, like fracking mechanism – may do so in the future? More about Dr Angela Connelly’s Riverside Art Walk with the Power and Water team and David Fraser here.